Quitting smoking is the single most important thing you can do for your health. That’s a fact. There is plenty of incentive to stop smoking, but it isn’t necessarily the easiest thing to do. The good news is that there is help. Acupuncture to quit smoking has helped a countless number of our own patients overcome their addiction and stay smoke free. Acupuncture is a highly effective, pain free method of reducing your cravings for nicotine, increasing your will power to stay away from cigarettes, and easing the tension and anxiety that accompanies quitting. 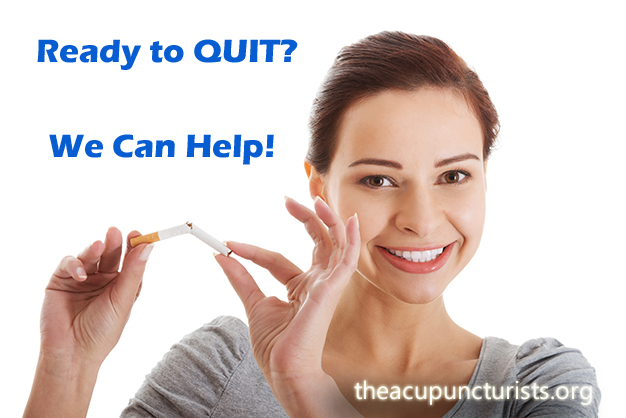 Acupuncture to quit smoking can work if you are ready to quit and willing to commit to the process. We’ve helped many people successfully quit smoking and we can definitely help you too. Our treatment program consists of 3 sessions spanning just one week. Imagine, in just one week you will be smoke free and moving on to a healthier new you! In addition to acupuncture, we may also prescribe chinese herbs to help reduce your cravings and eliminate toxins in between sessions. If you want the effects of your treatment to last it is a good idea to follow our herbal recommendations. Within just 3 sessions, a significant number of our patients report feeling less drawn to having a cigarette. The herbs we prescribe are highly effective, safe, yet affordable, and at only $15.00 per bottle, these powerful herbs will last you well beyond the first crucial week of withdrawal. The cost of the entire program to stop smoking is also very affordable. Here is the question you should be asking yourself… Is it worth it to quit? Well at $7.00 a pack, financially, YES, it is worth it. And for your health, ABSOLUTELY it is worth it! So why not get smoke free today? Call us at 954-586-CARE (2273) for a free consultation. We will explain in detail how our program works and how we can get you on the road to better health. The path to a healthier new you starts today! How Does it Work? Using Acupuncture to quit smoking is a very powerful cessation method that is worth considering if you are ready to quit. Acupuncture is virtually painless and highly effective. It stimulates powerful acupuncture points on your body and ear that reduce cravings for nicotine. Appetite suppression and withdrawal points are ALSO included in the stop smoking treatment. Our protocol consists of 3 treatments over the period of one week. Usually Monday – Wednesday – Friday or Tuesday – Thursday – Saturday. In the first session, the focus is to reduce your cravings for nicotine. 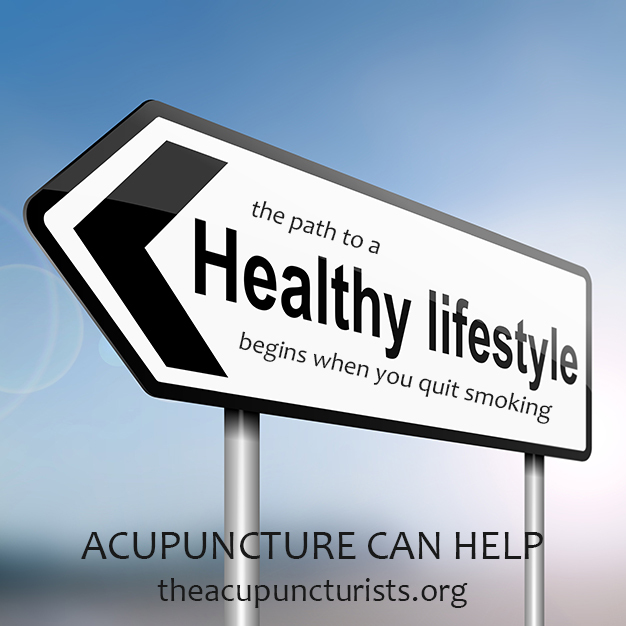 Acupuncture is an effective tool to enable one to quit smoking by minimizing cravings and strengthening will power. The Acupuncture intercepts messages sent by the brain to the body that demand more nicotine, thereby disrupting the addictive process. The second session is to ease the mind and reduce the anxiety involved in a withdrawal. Some of the largest stumbling blocks to becoming smoke free are the stress, anxiety, and depression associated with quitting. Fortunately, the acupuncture is quite successful at calming the nervous system and relaxing the mind, reducing anxiety, and alleviating depressive feelings. The third session begins the detox process. 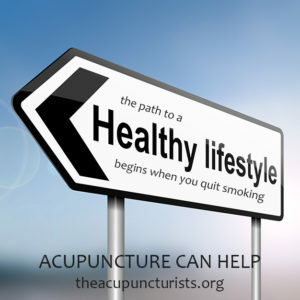 Acupuncture to quit smoking also helps cleanse your body of toxins which is important to people who smoke. Cigarettes contain dozens of harmful chemicals that you inhale into your system each time you light up a cigarette. The acupuncture can get rid your body of the built-up chemicals from your previous smoking habit. Getting these substances out of your body can be very helpful in quitting the habit and avoiding relapse. After the initial 3 treatments, the focus becomes maintenance and overall wellness. We recommend monthly treatments to maximize your health, provide support and keep your body in harmonious balance. There are a lot of triggers that can cause relapse and relapse can often times be part of the process. Cigarettes can act as a shield to insulate uncomfortable feelings and situations. A new nonsmoker can feel vulnerable and confused when trying to handle a stressful situation. So what are you waiting for? Stop smoking with acupuncture is the easiest and most effective method to break the habit. Take control of your health today. Call us for the free consultation – 954-586-2273 – it will be the best decision you could make regarding your health and well being. We proudly serve the cities of Margate, Coral Springs, Coconut Creek, Pompano Beach, Parkland and Boca Raton Florida. 1. Have a Support Person – The decision to stop smoking can elicit uncomfortable emotions. Ask someone who is available to you in the next few weeks to act as a sounding board and provide encouragement when needed. 3. Setting Boundaries – Set up contracts with other smokers to refrain from smoking in your presence. This includes spouses. When possible stay away from smokers until you feel more confident with your nonsmoking health status. 4. Drink water – Research shows that dryness causes cravings. Sip water frequently throughout the day. 5. Refrain or reduce your caffeine and coffee intake – Research shows that coffee causes cravings and dehydrates the body. If you are going to drink coffee, make sure you drink enough water throughout the day as well. 6. Food choices – Eat a lot of carrots, celery and other vegetables throughout the next few days. Candies upset blood sugar level, which can aggravate smoking-withdrawal symptoms. Sugar substitutes such as NutraSweet are sweeter than sugar and cause further sugar cravings. 7. Managing cravings – Cravings feel like they will last forever but actually fade in two minutes. Plan what you will do during a craving. Examples: Take your herbs if one has been prescribed for you; repeat your affirmation; breathe deeply; meditate or pray; walk to another place; sing a song; dance; call your support person. Learn more about how acupuncture works at the Frequently Asked Questions About Acupuncture section, or call 954-586-2273 for a Free Consultation. The doctors and staff have always been extremely helpful. I started taking herbs to relieve symptoms of menopause and they have helped me tremendously. Dr. Herbst always takes the time to listen to how I am feeling. I am truly thankful to have him overseeing my treatment! I began going to Dr. Robert Herbst in 2015 when I was struggling with unexplained infertility. He helped us conceive our beautiful little girl (which I wrote a review on previously with the timeline of that part of my story). I began going back to him again in July of 2018 as we were trying to have another baby with little success again. I was actually getting pregnant this time around but was unable to hold the pregnancies. When I met with him again, he asked me several questions and after looking at my tongue and checking my pulse, he basically told me in a nutshell that my body was in stress and I needed to take some time to reboot myself both physically and emotionally. I began doing acupuncture weekly, taking herbs again, and spending a little time each week on "me". He asked us not to try conceiving again for a couple months until he felt like I was strong enough. In late September he gave us the go ahead to try for this next cycle. We conceived our son the first week of October!!! I had really bad anxiety about losing this baby as well so I started going to him twice a week for a few weeks which really helped! I am currently almost 15 weeks pregnant and I can honestly say that both of my children were conceived because of Dr. Robert's help! I am so grateful for him and everything he has done for my family! I recommend anyone who is struggling with having a baby to go see him! Dr. Zhou and the rest of the staff were incredibly accommodating with my IVF transfer schedule. They didn't have a doctor on staff prior to my transfer appointment and completely redid their schedules in order to fit me in and make it to my transfer appointment on time. Highly recommend this practice. They truly care about their patients. After one round of unsuccessful IVF a friend recommended accupuncture to me. I can not express how grateful I am to have found Dr. Zhou. She is a very nurturing, knowledgeable and thoughtful practitioner. She took the time to talk to me before each session to see how I was feeling and explain each step along the way. While we worked to regulate my hormone levels she was by my side throughout this tough time keeping me calm and reminding me to stay positive. After four month of herbs and treatments we tried again and are happy to report I am now pregnant. Everyone in the office was friendly and helpful.